It's a new season of County League football in the women's game and I couldn't be more excited for the action to start, saw some fantastic matches last campaign and am eager for more of the same, albeit without quite so much rain. 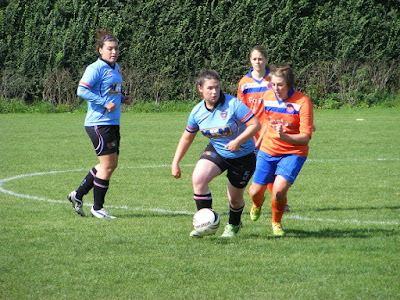 No better place to start than going to watch the Champions of Norfolk begin the defence of their title as Aylsham FC Ladies begin their league campaign with an away trip to Maltings Meadow to take on Bungay Town Ladies. Norfolk Women's Division One looks like it is going to be a highly competitive league this season and Aylsham FC Ladies will have plenty of challenges after their title with both last season's 2nd and 3rd placed teams Thorpe United Ladies and Wymondham Town Ladies strengthening their squads. Both the newly promoted sides Brandon Town Ladies and Lynn Ladies will prove tough opposition will fancy their chances alot of intriguing fixtures to look forwards too. Starting with today's match Bungay Town Ladies v Aylsham FC Ladies a rearranged opening day fixture as both sides original opponents are in FA Women's Cup action today. I saw Aylsham FC Ladies in action just the once last season an away game against last seasons early league pace setters Mulbarton Belles won the match 2-1 to go top of the league and from then on in never looked back maintained top spot seeing off everyone else to clinch the league title. The squad is largely unchanged from last season a couple of additions as they welcome a couple of players back. Several new faces in the Bungay Town Ladies squad, manager Graham Purling giving a handful their 1st competitive starts today. Have a new goalkeeper between the sticks, Rachel Moore who was at Harleston Ladies previously. 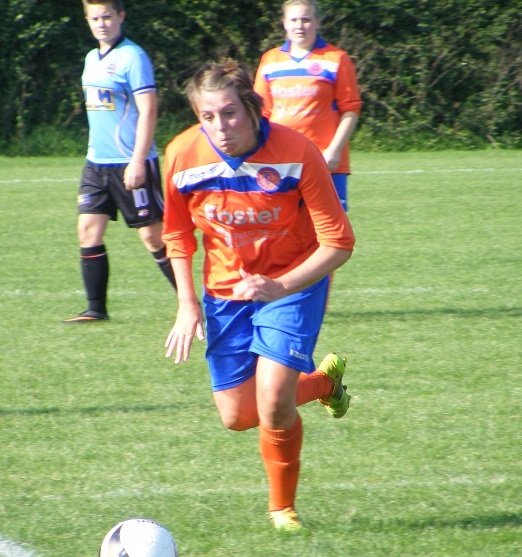 Taylor Whiting who comes in from Long Stratton Ladies along with Eva Evans from Norwich City Ladies. 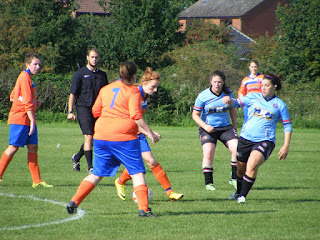 Emma Harvey and Nicky Hazell were with the 7 aside league set up last season. A side that is always likely to cause an upset. Would they start with a victory at home to the defending champions. 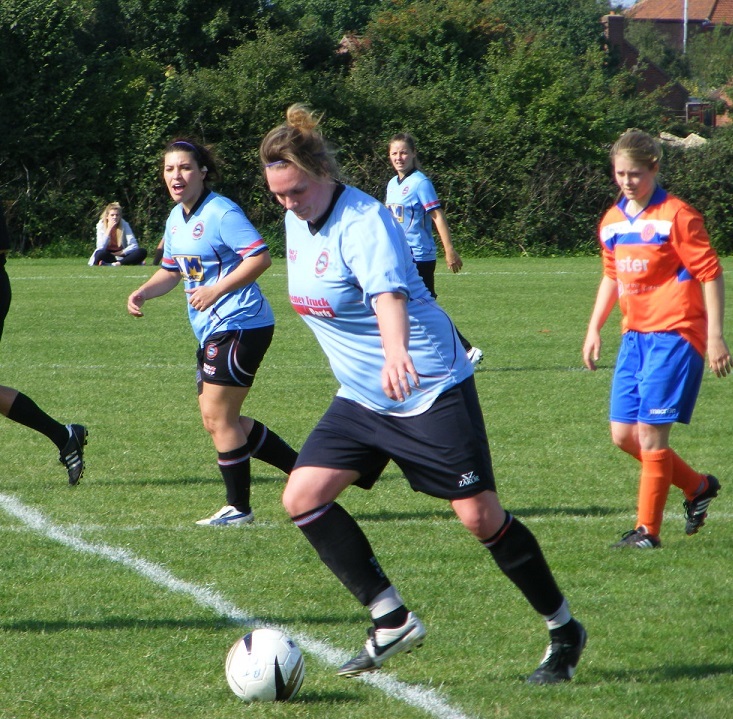 Maltings Meadow the venue Bungay Town Ladies are an integral part of the football club. Boasts great playing facilities and modern clubhouse, several pitches including the newly laid main pitch. Today the ladies would play on the pitch behind the clubhouse had that new season look about it freshly mowed, freshly painted. A good size and in very good condition. Graham did point out one draw back to me the now well established hawthorn hedge dividing the pitch from the cricket field beyond has cost the club more than it's fair share of footballs. Great weather for the start of the season, bright and sunny... it'll never last. Bungay Town Ladies starting XI - Rachel Moore, Kelly Collins (C), Emily Fusco, Lois Nethersell, Sian Carter, Inna Marx, Lauren Purling, Taylor Whiting, Eva Evans, Nicola Hazell & Emily Leach. subs - Hannah Taylor, Emma Harvey & Rebecca Goffin. Aylsham FC Ladies starting XI - Ania Vanston, Vikki Bird (C), Aneliese Smith, Alicia Lacey, Felicity Hunton, Debbie Kelly, Abbie Charlton, Emma Gillespie, Lisa Ferdani, Kiera Squires & Leanne Woodward. subs - Michaela England, Sarah Thompson & Sophie Burr-Walpole. It's Bungay to get the match under way wearing light blue shirts, black shorts and socks against Aylsham lined up wearing orange shirts with a blue and white band across the front, blue shorts and orange socks. The ball is closed down in midfield a fortunate rebound causing it to pop forwards presenting Bungay's Lauren Purling with an early chance to have a run down into space on the right of the pitch, driving forwards looks to put the ball into the box with both Nicky Hazell and Emily Leach beyond charging forwards to attack the ball is intercepted by Aylsham centre back Alicia Lacey who heads the ball away from danger. Aylsham launch a counter attack the build up down the right the ball slipped through into the path of Leanne Woodward as she bursts into space beyond the Bungay defence, Moore is called into action to make an early save dropping low to stop the ball at Woodwards feet inside the box. Is a fairly even start both sides want the ball up top as quickly as possible, Taylor Whiting gets hold of the ball sprays the pass out to Leach who is peeling out into the left channel in front of the area 20 yards out takes on the shot is blocked by Aylsham captain Vikki Bird, the rebound rolls back to Leach she has a 2nd go for goal doesn't get the contact she wanted the ball rolls harmlessly through to Sian Vanston in the Aylsham goal. End to end as Aylsham attack Woodward is put through again, Moore is hesitant to come stays on her line turns out to be a good call as her captain Kelly Collins makes up the ground on Woodward to force her wide left of the goal, Woodward still manages to get a shot away from a tight angle, Moore back on her line is able to drop and make the save holding onto the ball. Abbie Charlton drives past one Bungay challenge in the centre making a determined run to break through the home sides defence, Sian Carter comes across to put in the blocking tackle and set up a Bungay break the ball put long for Hazell to chase, takes on the shot as she reaches the edge of the area sends the ball over the cross bar. Aylsham are pressing numbers forwards up against the Bungay defence have four breaking free into space as Emma Gillespie has the ball at her feet wide on their right, opts to take on the shot from the angle, like Hazell moments before puts the strike over the bar. Charlton is the next Aylsham player to break behind the Bungay defence central, Moore has to come this time does enough to put the attacker off as they come together just inside the box Charlton putting her strike wide of goal. Michaela England comes on for Woodward, out on the right she is almost played in as Lacey clears the ball from her defence, is stopped by Lois Nethersell as the full back recovers the ground to put the tackle giving Aylsham their 1st corner kick of the match. Lacey is up from the back for the corner played in from the right rises to meet the ball with her head ten yards out puts the attempt over. Nethersell has a good throw on her as Bungay move the ball up the right the full back sends it into the area, Aylsham struggle to get it away as Leach capitalises from a bit of pinball in front of the area, sends her low driven shot across the face of the goal and out of play. 27 minutes gone in what has been a fast paced and action packed game so far and Aylsham are awarded a penalty kick. Very unfortunate to go against Bungay's Collins. It's England who bursts into space as Aylsham attack driving towards the box Moore comes to meet her, England's touch to take the ball past the keeper is a little heavy takes her wide left of goal to the byline she tries to cut it back along the line keeps it in Collins is racing back to slide in to block the ball has her arm out behind her to steady herself the ball strikes it the referee points to the spot. It's Lisa Ferdani who steps up to take the kick looks to place it wide of the keeper, sends the ball the wrong side of the post. Aylsham have a long throw specialist of their own in their captain as Vikki Bird launches the ball into the area from the right, Bungay get it out of the box comes back to Aneliese Smith 30 yards out she looks to send a flighted attempt over Moore in goal, the keeper is back on her line and well placed to make the claim. GOAL! Purling and Whiting have switched sides moments before, as Eva Evans, who has made a few forceful runs through the middle for Bungay already looks to push on again is stopped as she crashes into Felicity Hunton the ball though skips forwards the referee allows play to go on Purling and Leach are both out on the left, it's Leach that gets to the ball 1st left side of the area hits the shot with plenty of power low and hard across the goal and it goes in at the far post to give Bungay the lead 1-0. GOAL! One goal is soon followed by two as Bungay extend their lead, another throw by Nethersell on the left sets up the move the ball played into Inna Marx in the centre she sweeps the ball out to Whiting on the right corner of the area Whiting sends her cross into the box the target Leach six yards out she gets onto the ball and turns it home 2-0 with 5 minutes left in the 1st half. Leach nearly has a quick fire 1st half hat-trick as in the next attack Aylsham fail to clear the ball the low clearance pings back into Leach inside the area hits the shot early, pulls the attempt wide across the goal. GOAL! Instead of a 3 goal lead Aylsham hit back pinning the scores back to 2-1 as they pull a goal back, looks a poor call as the offside trap is sprung the flag stays down as Gillespie breaks into open ground in behind the Bungay defence, stays composed as Moore comes out to try and put her off, shifts the ball to her left half a yard to take it past the keeper and play it into the empty net beyond 2-1. An action packed 1st half with plenty of incident, a penalty miss, 3 goals and twice as many chances created. The Bungay defence has been the busiest with Collins often making the last ditch tackle to win the ball with Aylsham constantly looking to break behind them. Up the other end though the home side have caused their fair share of problems, both Leach and Hazell looking to get hold of the ball in attack Marx and Evans with determined runs from the middle. Will the 2nd half live up to the 1st halves action. Aylsham to kick off the 2nd 45, have Sophie Burr-Walpole on with Kiera Squires the player off. Early throw for Nethersell on the left high up the pitch puts it into Leach she drives to the by line holding it up before getting the cross in, a tight angle Vanston already has her near post covered scoops the bouncing ball up into her gloves. Gillespie is strong on the ball retaining possession on the left as she battles to push forwards with it at her feet holding off the challenge plays it into Ferdani in a central position in front of the box, she attempts to thread the ball between two players with Charlton making a great run in front of her is squeezed out the block coming back out to Gillespie she attempts to fire the shot back across goal goes wide at the far post. 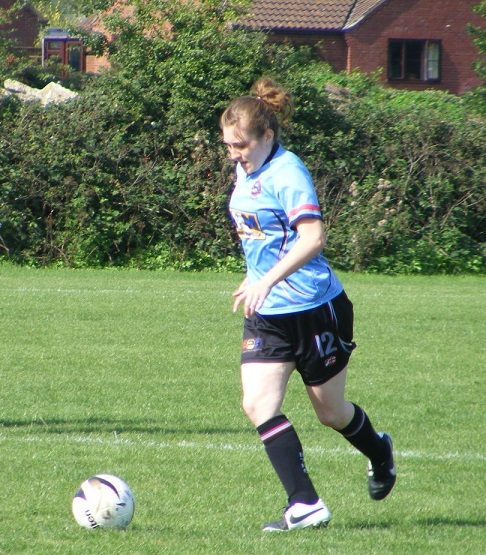 Bungay bring on Rebecca Gorrin for Whiting. Moore is off her line quickly to make a vital save at the feet of Charlton as she is played through inside the box. Ferdani is the next Aylsham attacker to be played in right of the goal, Bungay's Emily Fusco does well to get across her shield the ball back into her keepers gloves. Aylsham break up a Bungay attack with the cleared ball being flicked on by Charlton, to send Gillespie free to race after the ball Moore has come to the edge of the area trusts the ball will cross the line before Gillespie can reach her drops and sees it into her gloves. The kick out from the back is good from Moore the ball played up to Hazell who controls the ball and hits the shot on the spin 20 yards out off target goes wide of goal. Marx brings the ball up the pitch has both Hazell and Leach making good runs in front of her puts the pass into Hazell right of goal, she manages to bring the ball under control pass it into Leach free on her left, Leach's 1st touch is heavy by the time she hits the shot she is virtually on top of Vanston who stands firm to make the blocking save. GOAL! Bungay score a 3rd goal and it's Leach who gets it to complete her hat-trick. Play builds up down the left Hazell attacking forces Bird into conceding a throw on the left, Nethersell to take launches it into the area near post Leach attacks it has her 1st shot blocked/saved, loose it comes back to her inside the six yard box to stab home and extend the lead 3-1 18 minute gone. Woodwards comes back onto the pitch for Aylsham with Debbie Bird off. GOAL! Aylsham have had one quick reply before in the 1st half do it again in the 2nd. Is a screamer of a strike from Lacey 35 yards out as she latches onto a loose ball following a clash between Evans and Ferdani as the Bungay player attempts to drive forwards. Lacey racing to meet the ball hits it hard and accurate into the top corner 3-2. GOAL! No sooner have Aylsham pulled on goal back than they equalise, is a direct move as they break up a Bungay move the ball coming to England in the centre she immediately plays it on with Charlton making the run to get into the box left of goal takes the early shot sending the ball past Moore before she can set herself and into the back of the net 3-3. Aylsham having pulled the scores level are on the attack looking for more, have a free kick wide right Charlton plays the ball into the area, Woodward meets it with her head it loops up straight into the arms of Moore. England springs the offside trap bombs down the right before squaring the ball into the area Woodward is there central but scuffs her shot rolls into the keeper. Into the last 15 minutes Whiting is back on for Bungay, as Aylsham come at them again Ferdani sending the pass into Woodward in side the box, she shoots good save by Moore as she goes to ground pushes it wide of the goal, Woodward races after it goes for goal again smashing the rising ball against the upright, pops back straight into Moore gloves. GOAL! The visitors take the lead for the 1st time in the match. Charlton with her 2nd of the match as Aylsham are awarded a free kick on the half way line is taken quickly played down the left channel where Charlton is the willing runner the ball is allowed to bounce comes through to her the angle is tight Charlton gets to the ball turns and shoots sending the ball across the goal and in as Aylsham take the lead 3-4. Into the last 10 minutes Bungay have been rattled their play has gone a little ragged, Charlton is looking for her hat-trick robs the ball off a defender in front of the area then shoots places it straight at the goalkeeper. Purling tries to make something happen on the left of attack as she brings the ball forwards for Bungay try to pull the scores level puts it into Hazell who rides a challenge before getting her shot away from the left of the box, Vanston can watch it wide of her far post. Leach with good strength on the ball 20 yards out produces a good turn to move the ball to her right takes on the shot drags it wide of the goal. Aylsham see off a late Bungay surge prevent any more shooting opportunities as the final whistle blows they have the opening day win and 3 points on the board having come back from 3-1 down to win the match 3-4. A great game to watch as a neutral, 4-3's are always action packed great for the team that scores 4 agony for the team that gets 3. Good comeback from Aylsham were clinical for a 15 minute spell after conceding the 3rd goal. Bungay were undone in that same spell had put alot of effort into trying to keep their lead the 3rd goal needed to be defended for longer was a great strike from Lacey to reduce the deficit so quickly however. Great start to the Norfolk Women's football season thoroughly enjoyed it thanks to both sides for helping me out with the teams today and best of luck for the rest of the season.